You know what, I've never had the opportunity to work with IFL from the deployment side. How does one allocate DASD to Linux images on a mainframe? Do you have to give an entire LU to Linux and let it manage itself? Or do the Linux images sit inside a z/OS dataset? I have some places in my home where I want to install LED strip lighting, which requires 12 volt transformers. One place is in a bathroom, where I also want to install an in-wall Bluetooth amplifier. So I got to thinking: would it make sense to install a central 12 volt supply in the home and wire it out to the locations where it is needed? Is this a thing? Cars, boats, and RVs have 12 volt distribution, so why not a house? Mm. I don't know the answer, but doesn't low voltage have difficulty traveling very far unless the wire is extremely thick? I'd think that resistance would eat up the low voltage. Again, I'm very knowledgeable about electricity. I only know that in the house I'm building, the power company wants to step down its high voltage near my house, not hundreds of feet away at the street even though that would be a lot less expensive. Correction: Again, I'm ***NOT*** very knowledgeable about electricity. POE level 3 (I think that is what it is called or something like that), puts out a maximum of 13 volts. So you could just run cat 6 everwhere, and hook up POE injectors and run it that way. Then if you need to later you can use them as regular network, or what have you. I spent a lot of my childhood around boats, where there was always a 120 volt system and a 12 volt system. The 12 volt system did use thick wires. Remember that watts = volts * amps, so for the same amount of power, if the volts are lower the amps are higher. It becomes a question of what's going to cost you more, the loss from a transformer being less than 100% efficient or the thicker cables. Telecom equipment runs on -48 volts. It's the standard for their stuff. Their racks are always fitted with a -48 volt power supply (usually a few of them). The "UPS" is just a four-pack of batteries. It actually works really well, which is why equipment that can be used within a telecom facility is often available with your choice of power supplies: 100-240VAC or -48VDC. Some number of years ago there was a big push to move computer equipment to -48VDC so that the power supplies that are in servers etc. don't have to deal with as much loss. This push was killed by the fact that data centers would have to install giant copper conductors everywhere, and that was right around the time the price of copper started climbing again. 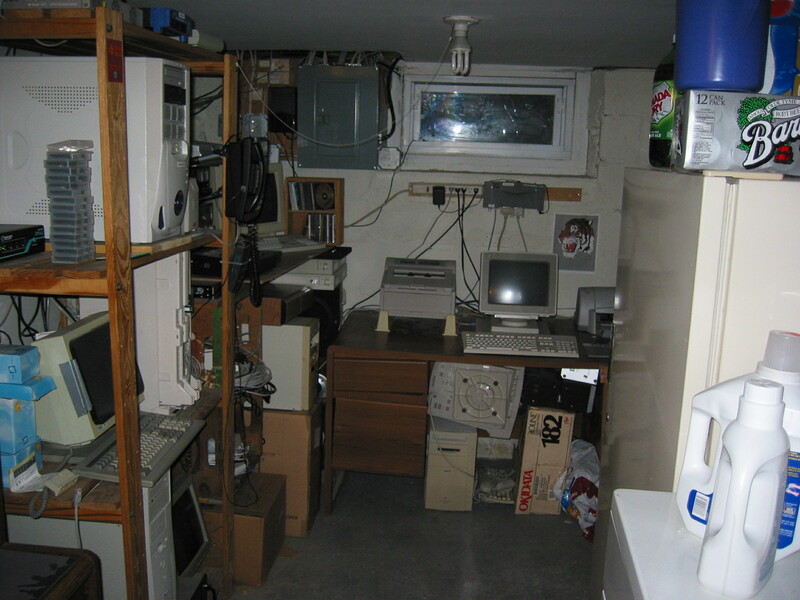 I found this old photo of my computer-filled basement from 2003-2004 or thereabouts. There's all sorts of wonderful stuff in there. Top left: a cheap wireless router (used only as an access point) and my DSL modem. The machine beneath it, between the stack of tapes and the UPS, is that era's iteration of uncensored.citadel.org. My phone system is there too, along with a dumb terminal I still have. My actual desk with the main screen is off to the left and just out of the shot. In the center are my printers and a thin client I used from time to time. Under that desk you can see stuff that was useless even then: a CB radio, a dot matrix printer, and a Mac. I'm still a server hugger, but everything now fits into a single 2U rack server thanks to virtual machines. I know people who still maintain home labs but I don't know why. This was a lot of fun but I don't exactly miss it. Dang. That brings back a lot of memories. Though the phone (wired including handset) hanging there amuses me too. You probably remember that phone system well. It was an Avaya Partner system that I picked up at a rummage sale in exchange for a $100 donation. It ran in my house for a couple of years, then I sold it for $500. I bought $200 worth of IP phones to replace it, stuck the rest of the money in the bank, and ran Asterisk for a few years. Then I got bored with maintaining it and just got an ordinary multi-handset cordless system. Nowadays I just don't bother answering the landline anymore because it's 99% robocalls. At the company, I currently work for, they run DC and AC to each Rack. The incoming AC to the building charges a huge battery bank about 24 hours worth of storage. From the battery bank it goes to the recifiers and either to the Racks for DC or to inverters which converts it to DC before it goes to the Racks. Then of course each rack is supplied with 2 sources of AC and DC with switches to auto switch over in case there is a failure on one leg. Data center DC is always -48 volts. This is a telco standard and it has been brought over to computing equipment as well. It's the reason PoE is the same voltage (but they may have flipped the polarity). Four 12 volt batteries in series will appear on a telco's power distribution rack. The ONT which terminates my home's fiber connection from Verizon has a built-in UPS, with a 12 volt battery inside. Over the past weekend I spliced into that battery connection and ran it outside the enclosure as a 12 volt power take-off to be used for "various things". I added a 1 amp fuse just in case something ever gets shorted out, so it doesn't destroy the battery. Right now it's just powering a bluetooth amplifier for the in-wall speakers I installed in my bathroom, but in the future I might add a small distribution board for other loads.